Motorsports are popular around the world, with the fastest cars and bikes going head to head. The spectacle of watching race cars battle it out at speeds over 180mph means this is one of the most exciting sports to watch. Many fans of motor racing in the USA also enjoy betting on the events. Major motorsports events take place all over the world and run from the beginning of the year until the end. This means that there should always be something happening for players to wager on. 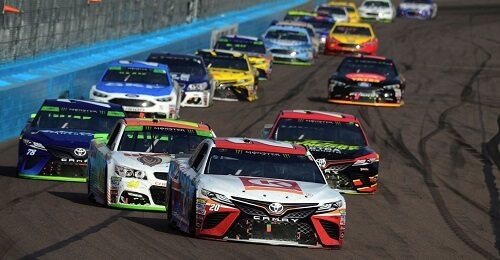 Below is our in-depth guide to betting on motorsports in the USA. There’s an old joke asking when motor racing began. The answer is when the second car was built. Racing cars and bikes has been around for a very long time and placing wagers on the events has always been popular. But, how can you ensure the most success possible? Below is a few tips on how to get the most out of your bets on motor racing. As with many other forms of sports betting, it is always a good idea to examine past events for insight into how future events will play out. The same is true for betting on racing. A certain driver may traditionally perform better on a specific track, or a certain team’s car is always strong at a specific event. For example, in Formula One, Ferrari’s Sebastian Vettel tends to do well at the Japanese Grand Prix, where as he doesn’t typically do well at the British Grand Prix. If you intend to bet on racing, these are the types on things one needs to consider. You can also look at the characteristics of an upcoming track and look at previous events to look for patterns. Again, looking at Formula One, between 2014 and 2017, Mercedes-Benz has tended to be more dominant at high-speed tracks, while Ferrari performed better at more technical circuits. Red Bull was even better than Ferrari at technical tracks. Players shouldn’t get worried about the number of drivers taking part in these events. Generally speaking, long shots have a very small chance of paying off. In Formula One, it’s almost guaranteed that Ferrari, Mercedes, and Red Bull will be in the top six. In NASCAR, you’ll almost always find Kevin Harvick, Kyle Busch, and Jimmie Johnson at the top. Putting money on long shots is pretty much a waste. Formula One is the pinnacle of motor racing in the world, with the fastest cars and most skilled drivers. The Formula One season starts in March and ends in November, with around 20 races over the course of the year. The F1 season sees races happen all over the world, including an American Grand Prix at the Circuit of the Americas in Texas. When betting on F1, some of the most popular bets are on which team will win the manufacturers championship. 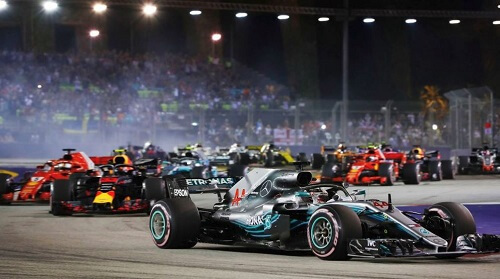 Since 2014, Mercedes-Benz has dominated the sport, winning the championship every year However, 2017 and 2018 saw much stronger challenges from Ferrari, who even looked like they would win, until bad luck and poor decisions cost them the championship. As for 2019, it’s anyone’s guess. Betting on the driver’s championship is also very popular. In 2017 and 2018 it was a battle between Lewis Hamilton and Sebastian Vettel, and we will likely see more of the same in 2019. But will Red Bull be able to consistently challenge for the championship? Will Vettel’s new team mate be fast enough? IndyCar is often seen as the Formula One of North America. Almost all of the races happen in the USA, but Canada also hosts one. The cars are made by Chevrolet and Honda, so there are only the two constructors, but there are plenty of great drivers. The driver’s championship is often hotly contested, which makes for exciting racing and betting action. 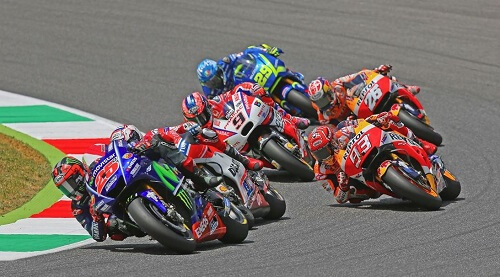 If four wheels isn’t really your thing, MotoGP is the premiere motorcycle racing competition in the world. Races start in March and run until November. While MotoGP holds races all over the world, many of them take place in Europe, with Spain hosting several. The racing is always close and exciting, with six different manufacturers providing bikes to the teams. Perhaps the biggest racing series in the USA, NASCAR starts in February and finishes in November. It is one of the longest racing calendars in the world. The racing is exciting, with plenty of action and crashes taking place. Some other big events to bet on include the likes of the 24 Hours of Le Mans. This 24-Hour endurance race takes place every year in France. While it forms part of an Endurance Racing championship, this is the headline event that attracts the most attention. There are plenty of other events around the world that attract more attention than the rest of the series. Players can also keep their eye on the Indy 500, the Bathurst 1000 in Australia, the Dakar Rally, the World Rally Championship, Pikes Peak, and the Isle of Man TT.